4th edition 2001. 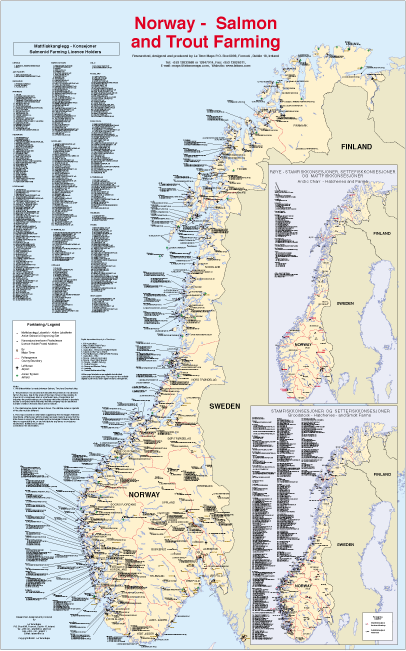 This map shows the location of all Salmon Farming licence holders in Norway (onshore and offshore). 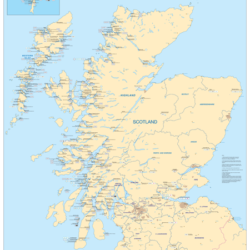 Species shown includes Salmon, Trout and Arctic Char: Inset maps for Salmonid Hatcheries/Smolt Units and Char Farms: Researched and Produced by La Tene Maps for the Publisher, Fish Farming International. 8th Edition. 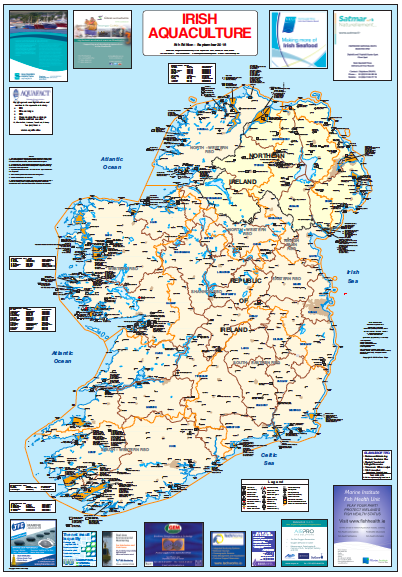 This map shows location of all aquaculture activity in Ireland North and South Species covered include Salmon, Trout, Turbot, Char , Mussels, Oysters, Clams, Scallops, Lobster and Abalone. In addition this map shows Shellfish Classification Areas. 2nd edition 2008. 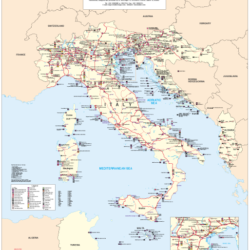 The second edition updates a map originally published by the company in the 1980's. This map is published in association with the British Trout Association to celebrate 25 years of the BTA. 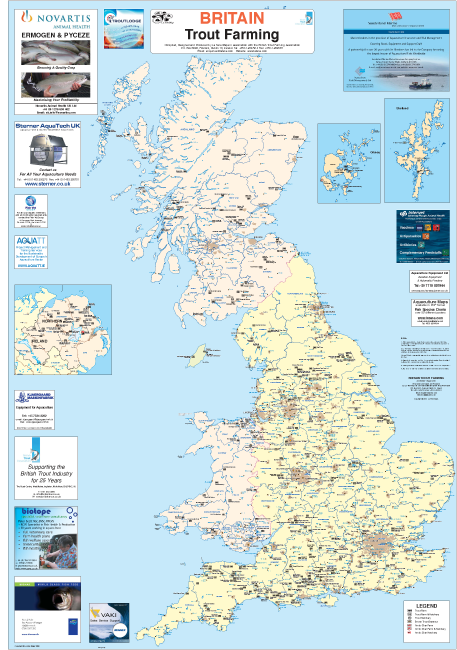 This map shows all British trout farms and hatcheries together with the site owner. Northern Ireland is included as an inset map. This map is available free to Members of the British Trout Association. 5th edition 2007. 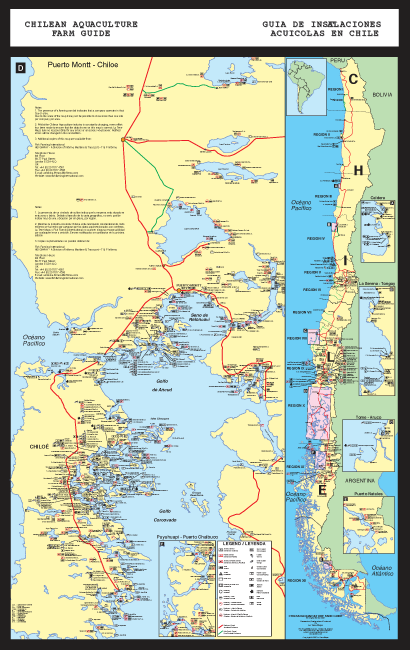 This map shows the location of all aquaculture activity in Chile. Species includes, Salmon, Trout, Turbot, Three species of Mussel, Native Oyster and Native Scallop. Researched and Produced by La Tene Maps for the Publisher, Fish Farming International. 3rd edition 2002. 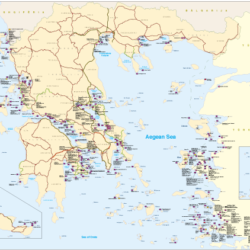 This map replaces the Greek Seabreaam / Seabass farning map first published in 1998. The map shows all the operational Seabream/Seabass farming sites, hatcheries, onshore tank farms. Also included on this map are marine sites with new species development and shellfish operations are shown where known. These are mainly mussel farms and a couple of scallop farms. Researched and Produced by La Tene Maps for the Publisher, Fish Farming International. 7th edition 2018. This map shows the location of all finfish activity in Scotland. 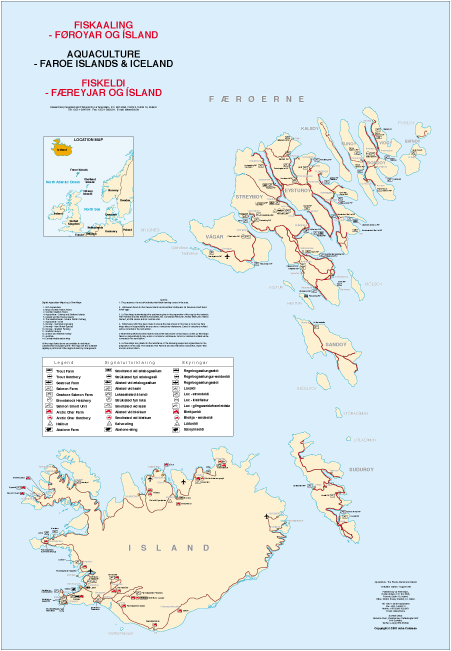 Orkney and Shetland are shown as insets. Species covered include salmon, trout, halibut, char, cod. Coarse, ornamental and cleaner fish are also included. Carries advertising. Publisher, La Tene Maps. 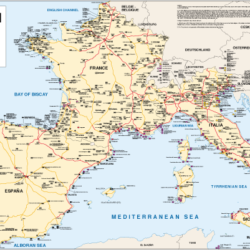 This map covers all countries in the Mediterranean Sea and is the first map available showing the situation in many North African Countries. Species covered include: Eel, Seabream, Seabass, Sole, Tuna and Mullet. Onshore Hatcheries are also included. The map contains insets for areas of intense activity and the Canary Islands. Publisher, La Tene Maps. 1st edition 1998. Shows the location of all aquaculture activity on the Faeroe Islands and Iceland. Publisher, La Tene Maps. 1st edition 2001. This map shows the location of all aquaculture activity in Italy, Croatia and Malta (onshore and offshore). Finfish species dealt with include: Seabream, Seabass, Trout, Turbot, Eel, Sturgeon and Tuna. Shellfish Species include: Mussels, Oysters and Clams. Publisher, La Tene Maps. 1st edition 2001. 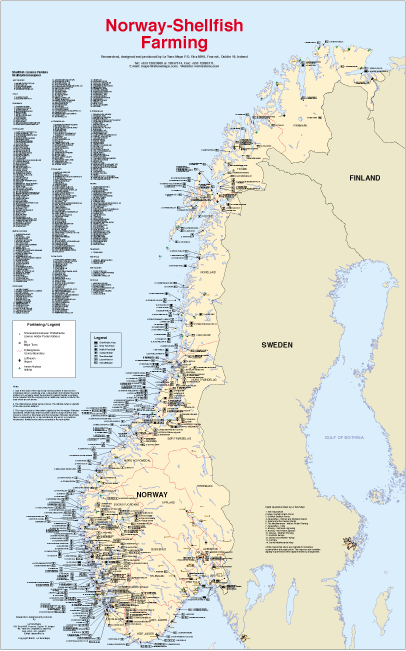 This map shows the location of all New Finfish Aquaculture in Norway. Species covered include; Cod, Halibut, Eel, Turbot, and other species. Publisher, La Tene Maps. 1st edition 2001. 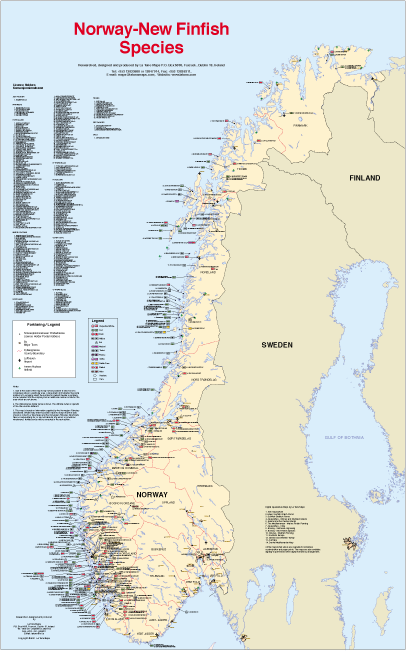 This map shows the location of all Shellfish Aquaculture sites in Norway. Species covered include: Mussels, Oysters and Clams. Publisher, La Tene Maps. 2nd edition 2001. 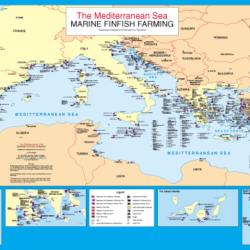 This map replaces the map Southern Europe and shows the location of all Finfish Farm sites in France, Portugal, Spain, Italy and Croatia (onshore and offshore). Species dealt with include: Seabream, Seabass, Trout, Turbot, Eel, Sturgeon and Tuna. Researched and Produced by La Tene Maps for the Publisher, Fish Farming International.